"The Twin Twist Bomb Was Dropped"
The Twin Twist was introduced to us on the Premiere and now considered our week 5 #BBTakeOver. Speculations have been rising in the Big Brother house this week about Liz being a twin. Everyone is questioning things about her like: weight, birthmarks, roots of her head, and personality. The HG at one point thought they were a little crazy but time will tell whats in store for them. Lets take it back to about week one before the BBLF were even on, Da’Vonne and Jason had speculations that something wasn't right with Liz. Soon to come out between Jason’s all knowledge of the game and Da’Vonne’s detail in paying attention, these two HG pulled a Nancy Drew and figured out the Twin Twist. 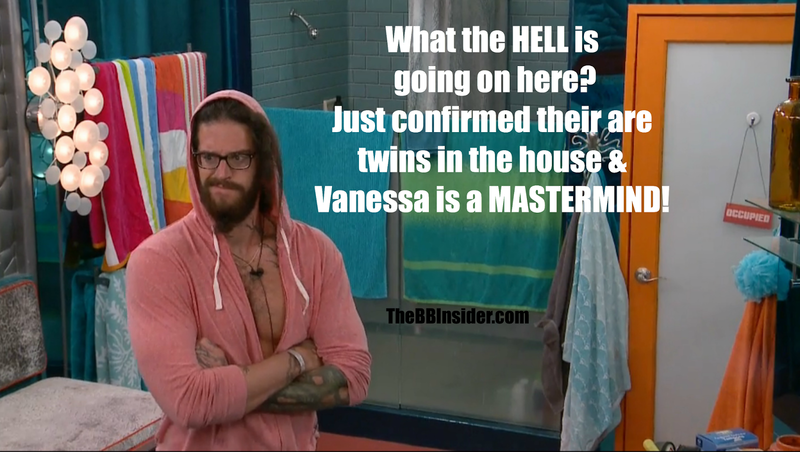 They really didn't keep it to them selves they slowly released the information among many HGs. Da’Vonne finally was the one to bring it to Liz”actually Julia” attention when they were alone in the bathroom. Liz”actually Julia” denied it but she told Da’Vonne that she appreciated her bringing the info to her and that none else did, and that she will give Mama Da’ her vote. Still with everyone running around the house trying to figure out if Liz is a twin or not, every time Lizia….. Lets have a quick little grammar lesson for someone you guys and gals when reading on twitter you will see “Lizia” and comments arise that bloggers and tweeters are spelling Liz’s name wrong, we aren’t people are using Liz & Julia’s name together so it =’s “Lizia” also it is a NOUN lol. Their is also one for Shelli and Clay but its not about them right now so lets press on. As I was saying, Every time Lizia goes in to the DR many HG swarm around to see if its Liz or her twin that comes out. It really hasn't worked yet! Now for the Juicy gossip “THE TWIN TWIST BOMB WAS DROPPED” in the Big Brother house last night…. well early this morning. (FlashBack to 2:08 AM “PST = Big Brother Time” Cams 3/4) to watch as Julia spill the Twin Twist to Vanessa. Julia admits everything, going as far as her name! Julia revealed to Vanessa that she is the one thats in the house right now. Vanessa looks so shocked but at the same time she is formulating a plan to keep Lizia safe(more so she can use it to her advantage). Vanessa says they need to bring Shelli/Clay/Austin in to the loop and Julia agrees. Julia also shares the vital info that at week 5 Liz & Julia will be playing the game!!! Vanessa then runs and tells Shelli and Clay the entire situation at hand(FlashBack to 3:07 AM “PST = Big Brother Time” Cams 1/2). Vanessa basically tells them that they need to keep Lizia safe at all cost because by week 5 they account as two individual people. So by week 5 their will be 6 solid people in our alliance: Me”Vanessa”/Shelli/Clay/Austin/Liz/Julia. She basically says that they will have the upper hand …..blah blah blah. Vanessa also says they need to protect Lizia as far as having Shelli helping her connect stories, covering up birthmarks, and Me”Vanessa”/Shelli/Clay/Austin creating a diversion when ever Lizia enters/leaves the DR, so none will be able to catch on to the Twin Twist any further. Last but not least, Vanessa pulls Austin aside in the bathroom this morning (FlashBack 9:30 “PST = Big Brother Time”Cams 1/2) She tells him everything about the Twin Twist, what she talked about with Shelli/Clay, and now she introduced that Austin can't trust Jeff because he is the male version of Audrey. Vanessa proceeds to tell Austin that Jeff is gunning for him and that everything Austin tells Jeff gets back to shelli/Clay. Vanessa also told Austin to go talk to those two about Jeff and they will explain it more! “Whomp Whomp Whomp No more Podcast on the Live Feeds anymore lol” Vanessa also tells Austin that when she needs to talk to him, that he needs to make the time. After all of this goes down Austin’s face is priceless and he has been thrown for a loop. Defiantly a crazy night in the BB house last night. I really thought that the Twins wouldn't crack. From the time in the BB house so far Julia has been a little sloppy with keeping info straight. I understand its hard for Julia to be playing someone else's game and not her own. She has to act like a totally different person even thought she's acting like her twin. We saw from season 5 when they did this twist that Natalie had a tuff time pretending to be her sister Adria. Watch season 5 Twin Twist Revealed, so you can get a sense of how fun/hard it can be! ICYMI: Da'Vonne received the "Last Laugh" power! She was the 7th HG to pick pub the phone but we don't know who's 3 votes she will eliminate tonight! So Tune in to tonights "Live Eviction" episode on CBS 9PM EST/6PM PST and see how the "Last Laugh", "Twin Twist", and the "BB Take Over" twist's explode!